Two years ago, we launched the new NurseRecruiter job board, one of the best online platforms for recruiting nurses in the United States. 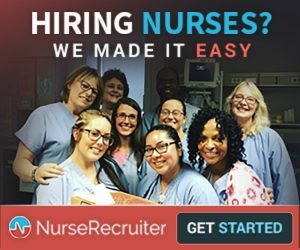 Nurse recruiters can use our service to post jobs, create saved search agents to get real-time leads on matching nurses seeking employment and search our vast database of hundreds of thousands of self-registered nurse job seekers to find the right candidate. If you are a nurse recruiter, you know you need to be on NurseRecruiter. We have now made it easier than ever for nonprofit nurse recruiters to get on NurseRecruiter and we are committing to provide up to $1,000,000 per year in free services to eligible nonprofit organizations. All U.S. nonprofit organizations that recruit or employ nurses (or other healthcare professionals) can now get up to $1,000 per year in free services and we have reserved space for up to 1000 nonprofit organizations to participate in the NurseRecruiter NonProfit Program. Does your nonprofit organization recruit or employ nurses? Would you like free NurseRecruiter services? If so, please register as a NurseRecruiter employer and apply to join the NurseRecruiter NonProfit Program so we can confirm your eligibility and get you started. Do you know of a nonprofit that could use our services? Please spread the word and let them know about the NurseRecruiter NonProfit Program.